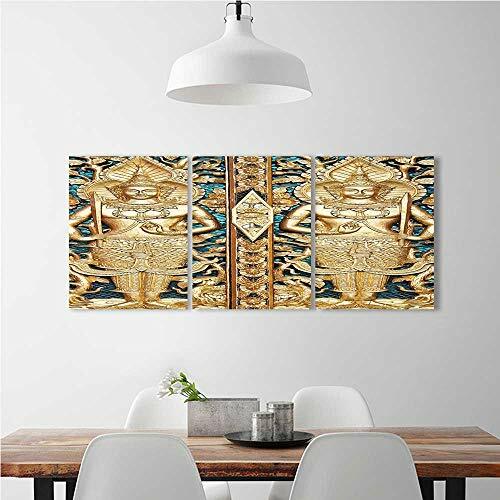 3 Panel Wall Art Set Frameless Rustic Thai Gate at Wat Sirisa Tong Thailand Buddhism History Spiritual Gen Teal for the kitchen, dining room, living room, bar and so on W24'' x H36'' x 3pcs by aolankaili at Thai City Deals. MPN: SLH-fok-0810-11322K60xG91/3p. Hurry! Limited time offer. Offer valid only while supplies last. Features: Size: W24'' By H36''/3P ①High quality! 100% Brand new! ②Material: VINYL and removable ③Environmental protection and waterproof. Material Details:70% MDF, 10% CANVAS, 10% FOIL, 10% GEL COAT.You can stick directly to the wall.Fashionable design and high quality environment Protection Nursery Wall Decals. Features: simple and convenient, free combination, color will not fade and stay bright and colorful, When you peel them off, there is without leaving traces on your walls and won't damage the decals, which could be used in second time. The DIY wall sticker is the best decorative decal in your house, not only beautiful but durable. It could decorate every corner of the room. Bright colors, creative design, highlight your life let you full of personality. Make the original bare space full of vitality. Let your family member to enjoy the fun of DIY 3D wall decal, you can also more easily to change your interior decoration style and house Atmosphere. To create your unique, warm and romantic home! Note: this new material is directly attached to the wall without a frame.Due to different brand of monitors, actual wall art colors may be slightly different from the product image. FRAMED REAL BEAUTIFUL ORANGE ALBATROSS BUTTERFLY DISPLAY INSECT TAXIDERMY 5"X5"X1"